From the kitchen of One Perfect Bite...Dinner tonight was based on a family meal we had in Thailand. While it hints of the Orient, it is a better example of fusion rather than Asian cooking. My family, young and old, enjoyed the rissoles which I served over a gingered noodle salad. Many will question why I used the food processor to chop the chicken when it can be purchased already ground. It has to do with the texture of the finished patties. Rissoles made from ground chicken offer little resistance to the tooth. Texture can be controlled when you chop your own meat. This recipe was designed to use ingredients that can be found in any large grocery chain. So, you'll find that the heat in the patties comes from jalapeno peppers rather than bird chilies, and that water chestnuts rather than Daikon radish provide the surprising crispness. This is a wonderfully inexpensive meal to feed a gang. 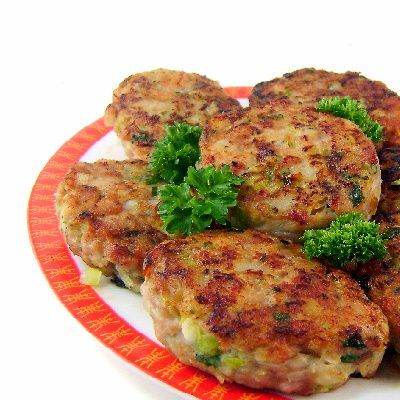 If you have time, or are into spearing food, the patties can be formed into small meatballs and threaded onto skewers. I prefer not to do that and, instead, make small patties and simply place them on top of the salad. I have ,in my long life, seen too many sword fights that result from the over-active imaginations of the very young who have bamboo skewers at their disposal. The patties, which are pan-fried, have wonderful color. I cheat to get that. I fry them in a mixture of ghee and canola oil, which allows me to cook the patties at a higher temperature for better color. I have a friend who lightly dusts the patties with an instant-blending flour to get the same affect. You'll notice that no binder is used in this recipe. The patties will hold together without one, but they'll be easier to form if you keep your hands wet as you shape them. Turn these only once. If the bottom side is golden brown the patties can be safely flipped without falling apart. If you have a food processor, these are simple to make and can be in the pan in less than 15 minutes. To be honest, I wouldn't bother with this recipe if I had to do the chopping by hand. I've become spoiled. Here's the recipe for those of you who are tempted to give these a try. I know you'll like them. I'll feature the salad tomorrow. 1) Working in 2 batches, pulse chicken cubes in a food processor until coarsely chopped. Transfer chicken to a large bowl. Add water chestnuts, scallions and jalapeno to bowl of processor and pulse until finely chopped. Add to chicken along with cilantro and salt. Stir together, using your hands, until just combined. 2) Use a 1/4-cup measure or ice cream scoop to form 12 patties. Transfer patties to a baking sheet. 3) Heat oil and butter or ghee in a large skillet over medium heat until it is hot. Working in batches, add patties to skillet and cook until golden brown, about 3 minutes per side. Transfer to a platter and tent with foil to keep warm. Yield: 6 servings.